The great thing about the way Jackpot Capital Casino structures its bonus offers is that you don't have to play every day to qualify for casino bonuses. Yes, top players do get bigger bonuses. But by including random draws in their bonuses this casino gives everyone a chance to score some bonus cash. 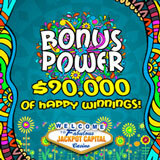 This month Jackpot Capital Casino players are flashing back to the Summer of Love for $90,000 in casino bonuses. Every Monday until October 18th, top players will get $15,000 in bonuses, and every Friday $5000 will be randomly awarded. You can earn scoreboard points by playing in either the online casino or the new tap-and-swipe mobile casino. Random draws mean everyone can win! Check your ranking any time at http://promotions.jackpotcapital.eu/bonuspower where complete contest details are also available. It's a good idea to visit the casino’s Facebook page too because there are always additional bonus offers that are only announced there. Jackpot Capital Casino's newest from Realtime Gaming (RTG) is Pirate Isle. Mermaid Queen was just added to the new mobile casino for smartphones and tablets.